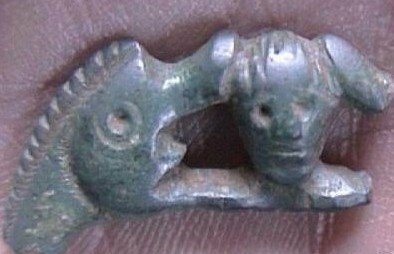 It is not just animal designs that appear on late Roman buckles in Britain. Human heads also appear. The heads which appear on British buckles always seem to be clean shaven and to have neat, short cut hair, often shown combed back in neat, tight lines. The faces are expressionless with a flat closed mouth and open, staring eyes (see 7, 8 below). Human heads have appeared on at least two buckles found in continental Europe, but both come form Germany, and probably from northern Germany. The lack of parallels elsewhere on the continent, and the larger number of head buckles found in Britain, suggests that the head buckles are primarily a British phenomenon. 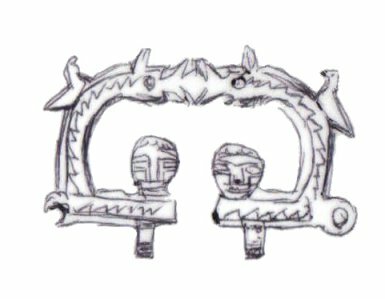 Supporting this interpretation is the fact that one of the German buckles (1) has unusual archaising features and big crests, both suggestive of British buckles, and, in addition, the head on the other buckle (2), while it has clear hair, has rather confused facial features which suggest it could be a copy made out of cultural context. 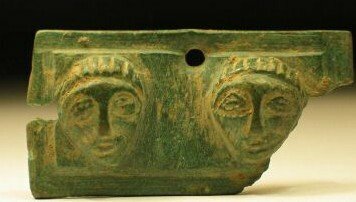 The severed head has a long tradition in celtic culture as a powerful magic symbol, and it is possible that the heads on the buckles represent a return to this tradition. Certainly the expressionless staring faces, seem to have much more in common with British and Roman British art, than classical Roman art. 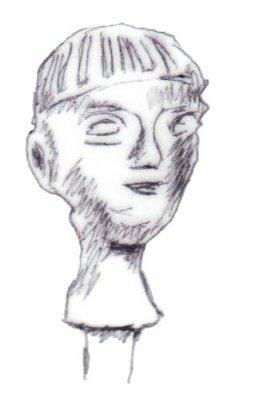 Compare the heads on the head buckles with other small British Roman or pre-Roman heads (3, 4). Equally, it is, of course, possible that the heads are purely decorative. It would not be too big a leap for a craftsman to move from the conventional globe held by dolphins, to a rounded head held by dolphins, and it would not be big a leap form the knobs which appear on the ends of some open loop buckles to the heads which appear on the ends of some head buckles. The third possibility is that the heads have some political military significance. Head buckles appear in Lincolnshire and Norfolk. The distribution of the Norfolk buckles is potentially most interesting, though the small number makes it difficult to be too sure of their significance. 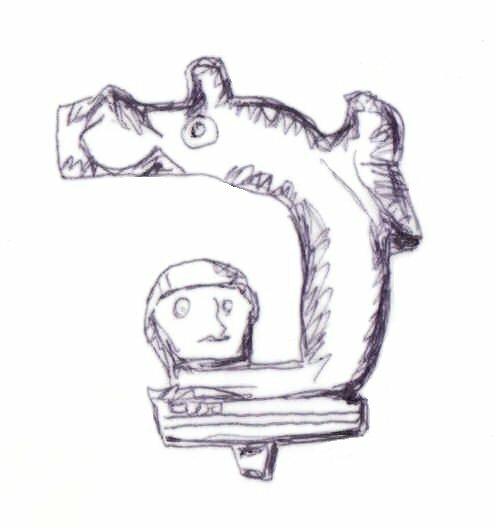 As discussed in more depth in the horsehead buckle section, there is arguably some correlation between the distribution of horsehead buckles with defensive linear earthworks and the political geography of 5th century Britain. What is of interest in Norfolk is that the horseheads seem to appear to the west of a defensive ditch system (Foss Ditch), while the head buckles and some closed loop dolphin types appear on the other. 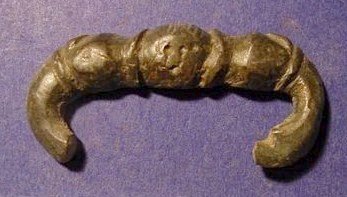 The two main Norfolk head buckles (7, 8) have both been found close to Caister St. Edmund, the tribal capital of the Iceni, so there is arguably a case here for suggesting the emergence in the 5th century of an independent state based either on old Iceni tribal boundaries or on those of the civitas of Venta Icenorum. 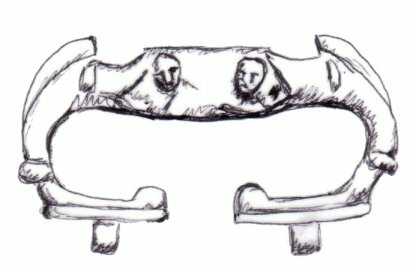 As noted elsewhere, the stylistic homogoneity of late Roman buckles in Britain, tends to lessen as you move further east and north. 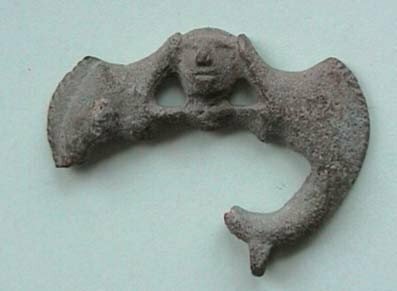 Since the head buckles are found in eastern and northern parts of Britain, it is not surprising that the heads appear on a variety of styles of buckle (5 etc.). 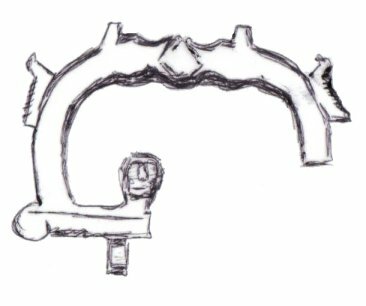 They even, appear on other elements of belt fittings. 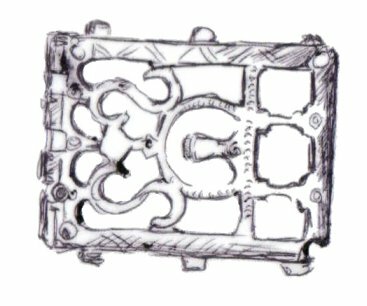 An openwork buckle plate (6) from Suffolk carries a head similar to those on the buckles, as does a strap end. 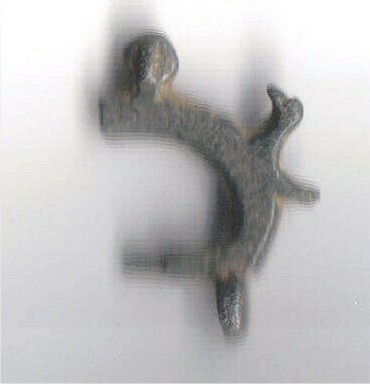 However, there appear to be two main groups of head buckles. In these, the head replaces the globe more normally held by the dolphins (7, 8). In these the heads appear as terminals on the open loops (9, 10, 11). Birds appear on the loops, making this a hybrid type between head and bird buckles. They are dealt with in the Beast Heads and Birds category (here). 5.1 Width not known, found Germany, redrawn after eBay; 5.2 Width 50mm, found Germany, private collection; 5.3 Head of pin, redrawn after Mills (C20); 5.4 Width 35mm, found not known, collection of Stuart Laycock; 5.5 Width 19mm, found near Watton, Norfolk, collection of Stuart Laycock; 5.6 Width 48mm, found Suffolk, redrawn after Mills (RB199); 5.7 Width 48mm, found Caistor St. Edmund, Norfolk, collection of Stuart Laycock; 5.8 Width 27mm, found Shipdham near E. Dereham, Norfolk, collection of Stuart Laycock; 5.9 Width 28mm, found Dragonby, Lincs., redrawn after Leahy (1); 5.10 Width 50mm, found Saltersford, Lincs., redrawn after Hawkes & Dunning; 5.11 Width 52mm (broken estimated), found southern Britain, redrawn after Mills (R200).